When piano students first encounter a fresh page of music, they will often wade through the notes as best as they can, fumbling here and there without an adjusted framing pulse or investment of animated interest in what the notes are saying beyond their humble, accurate identity. In this early stage “reading,” tempo is usually far too brisk (and erratic) for the new learner to experience any emotional response to a cascade of dizzying dots and beams. They are consumed with finding the right pitches and nailing them down. 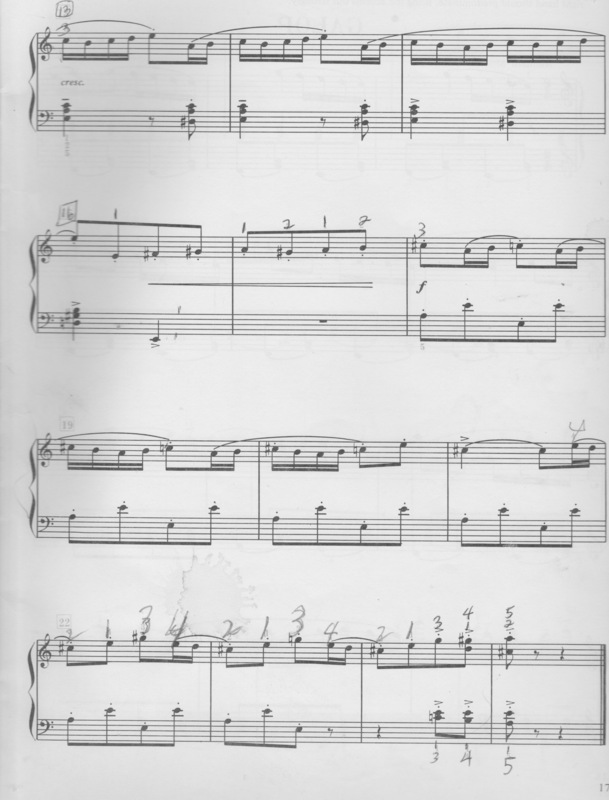 For this reason, I insist that my pupils separate hands, and slow down the pulse to frame a “deep” in the keys, mood-matching connection to a new score because every playing registers a profound imprint in their consciousness. So throw away trials that breeze over the character of a given composition only divert the learner from the essence of the new composition. 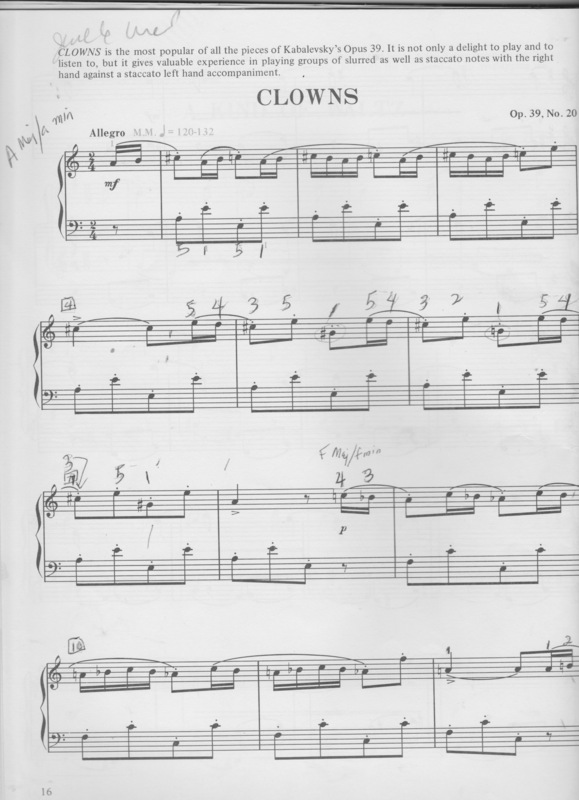 By example, I’m working with a student who’s enraptured by the intensely rhythmic and bi-tonal energy of Kabalevsky’s “Clowns,” yet there’s the same propensity to overlook the character/mood of this piece in the initial hit or miss the notes, baby-step learning process. In this video sample, the student takes the right approach, working assiduously on the first section, paying attention to spring forward staccato releases, and notated accents that he manages in a slow tempo framing. It allows him to capture the “feeling” and emotion imbued in this miniature. Naturally, his being “connected” to the circus atmosphere of “Clowns” from the very start makes his learning engagement deeper and more satisfying. Since Kabalevsky’s two-page composition has notable harmonic patterns, symmetries, agogic accents, inverted motifs, ostinato bass, etc. these present an opportunity to examine theoretical context as an aid to interpretation, noting that no dimension of learning is a pedantic side bar. Every examination of a piece becomes part of an integrated whole, of which the very first note ignites a rich emotional, cognitive and kinesthetic experience. Hello, Can i ask how long this student is taking lessons? What pieces did he learn the past 6 months? I Have also clown assigned last week. This student has taken lessons for about two years with me, but he had a period of three months off when his piano was shipped from the US to London, England which took time. He is simultaneously studying the Chopin Waltz in A minor, Op. Posthumous. He has also studied among other pieces the J.C. Bach Prelude in A minor, and the Mozart Minuet in F Major .. the one with triplet and 16ths dualism..He is very hard-working and spends a long time on his pieces. He plays scales and arpeggios around the Circle of Fifths. He is a dream student to teach because of his motivation and conscientious practicing.